I remember you and your Granny I believe one of her sons was killed by American friendly fire during the War. 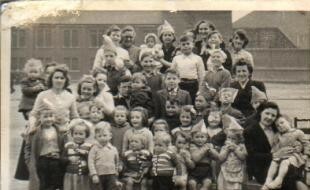 Here is a photo of the coronation party in the back court Raglan/Lyon St.
hi jackie my ma and my aunties were called mc cormick or mack a need to find some papers and my granda was blinded in the first world war he was 30 years older than my granny nellie she only had one kneecap and walked all her days with a straight leg a wonder if you are related granda was john and my aunties and mammy by oldest first elisabeth,catherine,ellen.and theresa all lived in cedar place until the late 50ies but theresa never left maryhill and is still there around the corner from maryhill road . Log on to google.com. go to the top and log on to images, then type in RAGLAN STREET,GLASGOW. and hay presto up will come RAGLAN STREET photos. 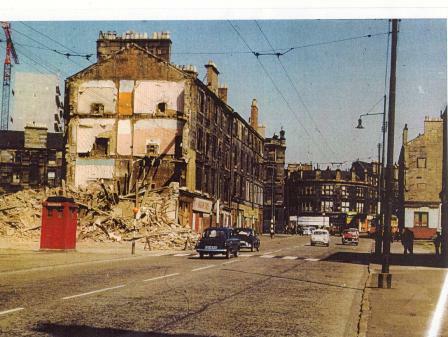 I loved reading all these replies about Raglan St and Balnain St. 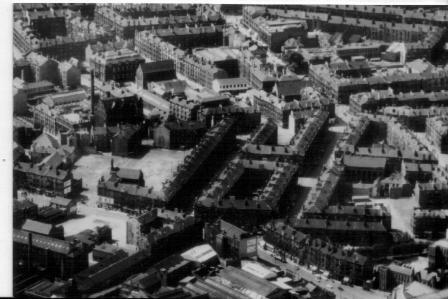 I didn't grow up in Glasgow, but spent many happy times with my nana and grandpa in Balnain St. My grandpa was in the merchant navy, and when he came home, he used to go to the swingpark at the bottom of Balnain St and take the children there to Woolworths and buy them all sweeties. They had a wee dog called Sandy, who did the rounds to the shops round about, getting treats from the shopkeepers. I went back recently looking for Balnain St, and was sad to find it's no longer there. I also remember my mum talking about Father Lynes. She went to St Joseph's too. Her name was Ruby Conlan. I don't know if anyone remembers her from those days.  I remember you gan.Do you have twin sisters Isabel & Anne who lived with there aunt and uncle (Dunn) who also emigrated to Canada? I lived at 48 Raglan Street until it was demolished I was freinds with thm until they emigrate, we attend the same schools(St Joseph's). My father and his family lived at 19 Raglan street in 1944,their surname was Duncan. It would be great to hear from anyone who knew them. My father was Alexander, his father Alexander, mother Grace and brother David. I would love to hear from anyone who remembers them. I, like every other child in that neighbourhood, remember buying toffee apples from the lady at the window. I was born at 61 Raglan Street in 1948 and my maiden name was Taylor - I'm related to the White family (grandparent's) who lived in the street for many years. My mum Ina, dad John and Sister Alice Anne (Gallagher) moved to Drumchapel around 1953 but I remember 'playing at shops' in the fruit shop in NorthWoodside Road when we returned to visit aunties and buy some messages every Saturday - the nice lady in the shop let me use the scales and put things in bags when customers came in while we were there. Our family. mother's 2 sisters and dad's sister, all lived in the same close which was right next to the dairy near the North Woodside road end of Raglan Street. I also remember the horse and cart rides that cost one penny and also the rag and bone man that gave you a balloon if you took out old clothes. Vague memories of the lamp lighter who the children followed around as he lit the gas street lamps - he also used to occasionally give us a ha'penny which would in these days be condemned as dangerous. Happy memories but I certainly wouldn't want to return to the living conditions that prevailed then - I enjoy my modern luxuries. Interesting that there is a push to resurrect trams ! my dad used to driive the old Glasgow trams that are now in the museum. It has proved impossible to find a decent picture of this street, so I'll add what I have. I may have posted these on other threads. They show the entrance to the street on Garscube Rd. - you can just see the street sign, middle left, and a part of the street to the left of the partially demolished building - and an overhead shot of the Round Toll area. Hello to Hudggy, how are you doing? 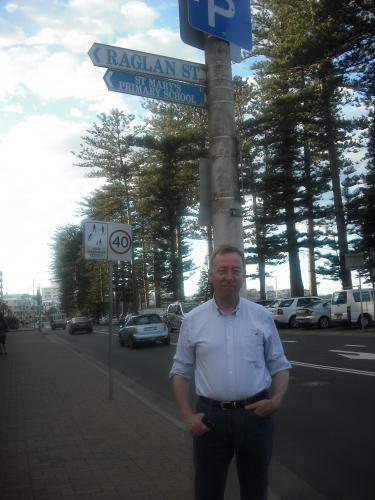 Finally got a picture of Raglan St. Two things though - it's in Sydney and I'm in it! My late,great aunt Mrs Thompson owned the fishmongers shop at number 8 Raglan Street in the 50s and 60s until the building was demolished.The shop had a big stags head up on the wall and a massive big stuffed fish in a glass case also up on the wall.Perhaps some readers will remember the shop. Eddy I seem to remember your face from Garscube Rd I know you say you came from Oakbank Terrace. Jupiter I remamber your aunt and her shop we used to get our fish from her I stayed at 13 Raglan St with my gran she sold candy apples from her window you may remamber. Huddgy, your ringing a bell with the candy apples.Was there not a pawnshop on that side of the street.I also recall the hairdressers,Mrs Ionta.She always had wee yappy poodle dogs.In fact my mother who worked in the fishshop bought one.I remember picking it up at the old Buchanan Street train station.She had the wee dog for years.